Given my affinity for snacking, the truth is that my entire life falls under the category of snack season, but still… SNACK SEASON IS UPON US! Time to bust out your best for the big game day or movie marathons or after school/midday snacks. The recipe I’m sharing today is a chameleon. 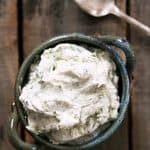 Oh sure, it’s Spreadable Ranch Cream Cheese which may not sound so impressive at first listen, but let me tell you WHY this is something you want to whip up, and fast! Spreadable Ranch Cream Cheese solves a total first world problem; how to spread the dadblamed hard cream cheese evenly on your beautiful bagel or toasted English muffin bread without tearing great chunks from it. The struggle is real, friends. And buying little cups of the spreadable cream cheese at the store just isn’t a solution around here, given the quantity of food we go through. Besides, I might be (am) a slight (total) control freak, and enjoy (require) being the one who decides the final flavour of the food on our table. Hooray for Spreadable Ranch Cream Cheese. 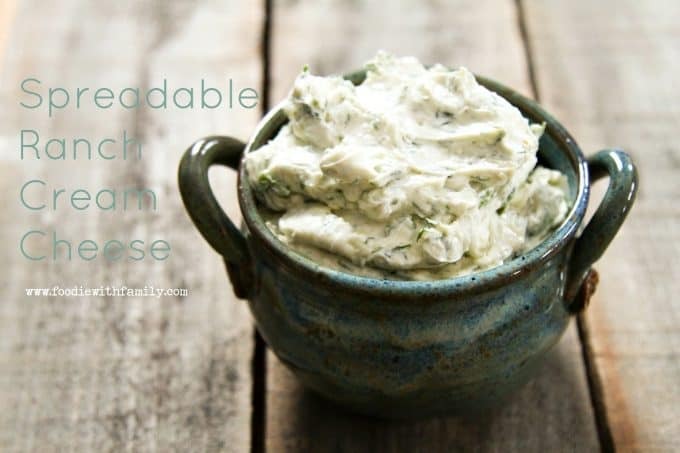 It is what it sounds like; smooth, spreadable cream cheese filled with loads of fresh herbs, a little garlic, and a hint of lemon juice that tastes just like the perennial favourite Ranch Dressing. Obviously we SPREAD it on the aforementioned bagels and English muffin bread, but we are also fond of using it as a DIP; thus the chameleon comparison. Because it’s looser than brick cream cheese, it lends itself beautifully to dipping with pretzel rods, chips, vegetable sticks, crackers, and even bread cubes. We don’t stop there, though… No way. 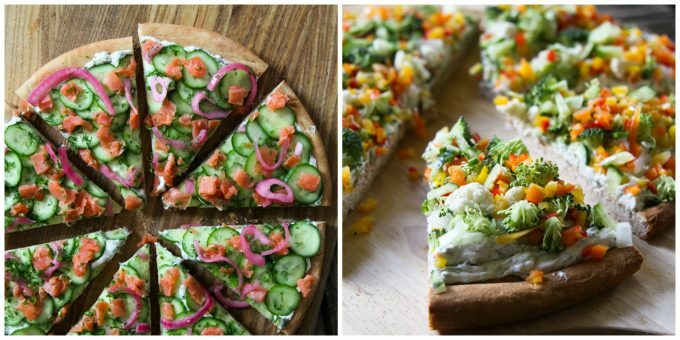 We also dollop spoons of Spreadable Ranch Cream Cheese on baked potatoes and use it as the ‘sauce’ on a couple delicious snack pizzas I’ll be sharing here over the next couple of weeks. You can opt to use full fat cream cheese or Neufchâtel cream cheese (which is most often sold as 1/3 less fat cream cheese but is really just a creamy cheese that naturally has 1/3 less fat) in this recipe. I don’t advise non-fat cream cheese as that just won’t behave the same way. 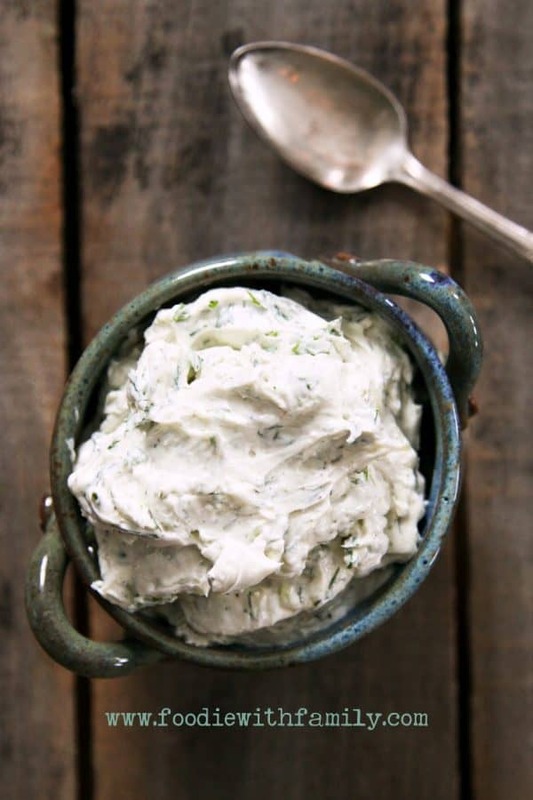 The bulk of the Ranch flavour in Spreadable Ranch Cream Cheese comes courtesy of the combination of fresh herbs. If you want to really boost the Ranch quotient, you can mix in a tablespoon of dry Ranch dressing mix (either homemade or purchased). This is optional, but we often do it because RANCH and KIDS go together like gloves and hands this time of year. You can eat the Spreadable Ranch Cream Cheese immediately after making it, but the flavours meld and improve if allowed to rest, tightly covered, in the refrigerator for at least 30 minutes prior to serving. Spreadable Ranch Cream Cheese is good for up to a week when stored tightly covered in the refrigerator. Ours is always gone before that point, but from a food safety point of view, it should last that long if your willpower does. 1 tablespoon dry Ranch dressing mix homemade or purchased. Put the cream cheese in the bowl of a food processor fitted with a metal blade, or in a stand mixer fitted with a whisk, or a mixing bowl with a hand mixer. Blend the cream cheese with the milk and lemon juice until smooth. Add the remaining ingredients and pulse until evenly combined. Scrape into a container with a tight fitting lid and refrigerate for up to a week. The Ranch Spreadable Cream Cheese is good served right away, but improves if allowed to rest, refrigerated, for at least 30 minutes before serving. Rebecca, you are KILLING me!! I am trying to start the new year off on a healthier note. First the bleu cheese dip, then those GLORIOUS bacon wrapped onions rings (God, help me I can’t dwell on those) now this!!!!! How is a girl suppose to read your blog and loose weight????? …..teehee….. This sounds insane Rebecca! So tasty! !